MIKE "Mr Cricket" Hussey has hardly put his feet up since retiring from international cricket early last year. At 39, he is still a valued member of the Sydney Thunder and Mumbai Indians Twenty20 teams. He is also doing his bit for children's charities and grassroots cricket. 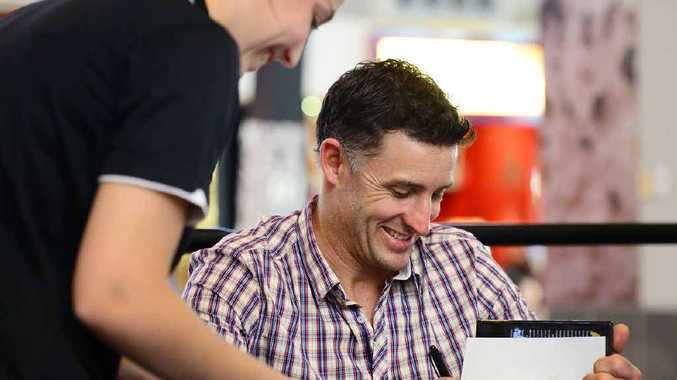 Hussey is an ambassador for the Commonwealth Bank's Grants for Grassroots program, which awards 90 cricket clubs with a cash grant of $1000, and equipment. He is also one of the faces of the Starlight Children's Foundation, which provides programs for sick children. How's life been after retiring from international cricket? It's been less stressful and there's been a lot less pressure. I don't miss it and all the hard work that came with it, but I miss the camaraderie among my teammates. With the Commonwealth Games just finished, would you like to see cricket become a part of the program again, like it was at Kuala Lumpur in 1998? I'd definitely love to see that happen again. You look at a game like Twenty20, and it's over in three hours. I think that would make a great fit. You're still playing some good cricket for the Mumbai Indians in the T20 Indian Premier League. We have India coming out here this summer. How strong is cricket in India and Australia right now? Guys like Sachin Tendulkar and Rahul Dravid have inspired a whole generation of young players. But the talent coming out of Australia is also amazing, and the facilities and coaches we have to develop those players are world class. It's a great time to be a young cricketer in Australia right now. Tell us what it's like being a big-name cricketer in India? India is out of this world - it's crazy. I feel sorry for guys like Sachin and (current captain) MS Dhoni. They get mobbed by thousands of cricket fanatics everywhere they go. You see cricket played on every spare patch of ground everywhere you go, and as an overseas player, it's just great to go over there and experience all that. The IPL is terrific because you get to play alongside guys from all over the world - New Zealand, India, South Africa - and learn about their cultures and what makes them so successful. Cricket's not a cheap sport to play with the registration and equipment costs. It is a long game and many people are time poor. So the Commonwealth Bank's Grants for Grassroots program, that you are an ambassador for - does it give those doing it tough a chance to receive a reward for all their efforts? Without a doubt. It's a great concept and I'm really happy to be involved with it. We want to help out local clubs as much as we can, and these grants that are available will hopefully do that. You're also an ambassador for the Starlight Children's Foundation. Do you admire someone like Anna Meares and all the charity work she does for sick children? Anna's an inspirational person and she has done some great work off the track. She was a brilliant choice to carry the flag for Australia at the Commonwealth Games opening ceremony. I could always do more for charity, but I always get touched by the stories of these kids and their bravery. I love going in there to visit them and putting smiles on their faces. You spent so long biding your time at first-class level before finally getting your shot in the Australian Test team, at the age of 30. What's your advice to young cricketers coming through now that are keen to make a living out of the game? It's so competitive right now, but our pathways systems are terrific. The mentality you need will never change - you need to work very hard. But the key is to enjoy it and cherish the lifelong friendships you will make. I can't recall Matthew Hayden's averages and statistics, but it's the experiences I had playing alongside him that I'll always remember. Cricket's such a social game, and it's all about helping out your mates.